Young 26 year old Thai man was found by rescuers trapped inside his wooden seafront home on a light mattress. At the scene, medical personnel and rescuers improvised and worked with locals to get the acutely ill young man on to a small boat so that he could be transported to a nearby hospital in Pranburi. The man had last visited a hospital in 2012, when he weighed 36 stone, but the threat of surgery had left him in fear of medical intervention. 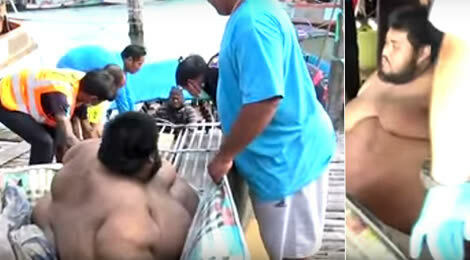 A massively obese 26 year old Thai man in Thailand’s Prachuap Khiri Khan province had to be rescued by dozens of medical personnel and local volunteers in a dramatic intervention. The complex and difficult operation took place when the emergency response team removed the naked man, who was experiencing a health crisis from his seafront home, to a local hospital. It was the culmination of eighteen years of chronic overeating. Thai man removed from wooden seaside home after nearly 20 years of binge eating on seafood and ice cream left him weighing 50 stone or 300 kg. The intervention by a medical and emergency response team took place last week came after his condition developed into a full blown medical crisis. Thongchai Jamjang was lucky that the skill, determination and co operation between emergency professionals and local neighbors got him out of his home and on to the hospital in a 2 hour complex, logistical operation. He is now being stabilized at hospital where doctors are considering inserting a gastric band to help the young man tackle his obesity. The young man weighed 50 stones when the medical emergency team found him within his wooden sea front home, stark naked. He could no longer fit into human clothing. The man, named as Thongchai Jamjang, had become trapped in his home some years ago as the weight piled on from his decades long eating binge that did not let up. Local reports suggest that the young man began to put on weight when he was only eight years of age. His mother and some locals, last week, blamed his condition partly on the abundant availability of seafood in the beautiful Thai coastal region that has made the province of Prachuap Khiri Khan a popular favorite with foreigners in Thailand for years. This and his penchant for ice cream as well as sweet Thai desserts. Thongchai’s home is situated on the seafront like many Thai homes in coastal and riverfront areas. The rescue operation was prompted by the young man’s health crisis which began to alarm his mother in December. This and his shock loss of appetite. The young man began, at that point, to experience the onset of breathing problems which became chronically worse until this week’s rescue. The situation had then become a challenging medical emergency. The medical experts decided that they had to intervene late last week when his breathing difficulties became acute. ‘He obviously had breathing difficulty, making his blood oxygen shockingly low. All we could do was give him oxygen while waiting for him to get to the hospital,’ one rescuer, Phukit Phokawat, was quoted by the Daily Mail newspaper in the UK. Coverage of the incident, on Thailand’s balmy coast was international. People worldwide were horrified at the young man’s condition. Thongchai Jamjang, the 26 year old Thai man, lives in Prachuap Khiri Khan, a town located in southern Thailand and which is the capital of Prachuap Khiri Khan Province. According to Thongchai’s mother, her son had developed a great fear of hospital and medical professionals. This followed a visit, at his mother’s insistence in 2012, when he was advised by a doctor that he would be required to undergo a medical procedure to his stomach to make it smaller and drastically reduce his food intake. At that time, her son weight over 36 stone. However, the man’s mother said she had never quite believed that her son’s overweight would one day pose such a serious health threat to his life. Her fears, on that score, began to be pronounced last month once she observed that he started to have breathing issues and the biggest horror of all, a loss of appetite. This is the point where Thongchai’s mother began to consider that something serious would have to be done to rescue her son. Finally, as his situation deteriorated last week, she had to call the local emergency rescue unit and ask for their help. ‘His health was getting worse so I decided called the rescue volunteer unit and ask for help,’ she explained to the media. According to the Thai press, health rescue volunteers intervened and found Thongchai sitting naked on a mattress in a covered front area of his home, a wooden structure on stilts, that overlooks the beach in the town where he lives. After receiving an urgent help call from the Thai man’s mother, a group of four rescuers hurried on to the scene in the wooden seafront structure amid other neighbours and dogs wondering what all the commotion was about. There were some nervous moments when rescuers found it initially impossible either to lift or move the Thai man’s huge bulk and weight. At first, the nervous team attended to the man’s health on the spot, checking his vital signs. They arranged to cover him in a blanket to protect his dignity and then addressed the task of moving him to hospital. According to reporters, he needed to be covered with a blanket since he was simply too big to wear any kind of clothing. Rescuers were in agreement that the young man was indeed in the midst of a health emergency. Up to 30 people were involved in lifting the man in the flimsy mattress through a specially constructed bridge made from bamboo at the home. The large group was made up of local neighbours as well as rescue and medical personnel. This was followed by an operation using the handmade wooden ladder to move the man to a waiting emergency rescue boat. Finally, in cooperation with his neighbors and family, the rescue group had managed to take him from his home onto a boat. After the boat journey, Thongchai was lifted onto and ferried by a waiting truck and emergency support ambulances. The patient reached the hospital two hours later. Thongchai was admitted to Pranburi hospital, located in Pranburi, a local hospital with a good reputation. Doctors there were reported to be exerting efforts to stabilize the man and rescue him from his immediate health crisis. Phukit Phokawat, the rescue officer taking part in the rescue group who helped take Thongchai to the hospital, told reporters that the man was experiencing a very critical health crisis. It is understood that medical experts may, after stabilizing Thongchai, then consider and move ahead with attempts to affix a gastric band to the Thai man’s stomach. This is a silicone implant which restricts the ability of the stomach to absorb food. Here are some tips of how to avoid become overweight and live a healthy life. Thailand is a country where, either on holiday or leading expat lifestyle, it is very easy to pile on the pounds. The relaxed atmosphere with year round sunshine and an abundance of delicious, inexpensive Thai food make it a idyllic for many foreigners. The country boasts a very convenient mix for foreigners with hundreds of thousands of small food outlets to 24 hour call out takeaways from all the world’s big names such as Mc Donalds or Burger King at prices well blow western levels. It is easy to get overweight and quickly. In the past four decades, the incidences of diabetes among foreigners in Thailand has grown at a hyper rate. The incidence of diabetes among Thai adults runs at 9.6% but the real level is thought to be at least twice that. Among foreigners the rate is higher than this according to one Thai doctor, who estimates it at 15%. The incidence of diabetes in western foreigners is generally lower but the number of middle aged foreigners and older men living in Thailand is quite high. One researcher estimates that up to 30% of western men living in Thailand, and who are over 60, have type 2 diabetes. The standard medical advice from doctors to people is to eat healthy food along with exercising for at least 30 minutes a day. Eating fruits, vegetables, and grains are also highly recommended by the medical fraternity; cutting down fatty and sugary food consumption is also an excellent way to avoid becoming overweight and so facing health related issues. Doctors in Thailand stress the need for responsible exercise however and many recommend the simple practice of walking. Last week Thai emergency responders and locals in the beautiful Thai province of Prachuap Khiri Khan all worked together to rescue a Thai man trapped in his home after eighteen years of binge eating on seafood and ice cream resulted in him becoming 50 stone in weight and suffering an acute health crisis. His mother called in the doctors when her son began to have problems breathing.